Set in the not-too-distant future, Data Runner is a an action-packed thrilling ride. A few giant mega-corporations own nearly everything – including the internet. The only way to transmit sensitive data is to employ runners to carry the data from one location to another. They do this by getting the digital information injected into a special device inside the runner and it is extracted when the runner reaches the rendezvous point. Safeguards are in place, which includes the destruction of the device (and the runner) if improper extraction were to take place. Despite the dangers of being a data runner, Jack Nill needs the work in order to make money to get his father out of a large gambling debt. Jack is a math genius and a champion of parkour – which makes him a natural as a data runner. But when a stranger loads Jack’s data chip with a message it suddenly seems that the entire world is after him to get at that message. This was such a simple concept. Anyone who has worked in a large city (such as New York or Los Angeles) has encountered runners scurrying from one large business to another. Updating this idea just slightly gives us a tremendous, dystopian YA novel that will really appeal to young men. The book starts just a little slow as author Sam A. Patel gives us a lot of information to set up the premise and the world we are in. But if you stick it out, the payoff is well worth it. The last quarter of the book is mostly non-stop action and Patel delivers it very smoothly. I was completely brought in to the story and reading rapidly to turn the page to see what would happen next. The science was believable and incorporating parkour was a stroke of genius. Patel writes the parkour scenes well and it fits nicely in the story. All in all, this was an exciting read and it isn’t often that we get tremendous adventure fiction for YA boys, but this is just the thing. Looking for a good book? 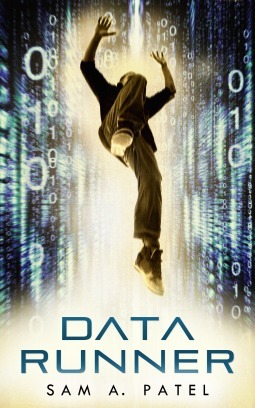 Data Runner by Sam A. Patel is an exciting sci-fi adventure.